Analyze a realistic situation mathematically. 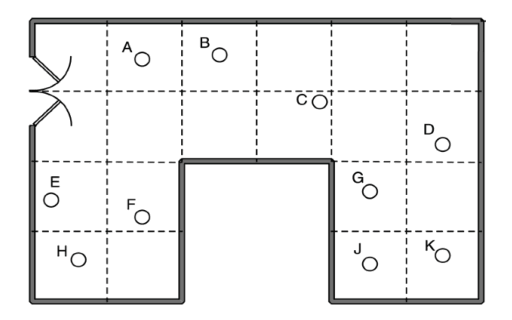 Construct sight lines to decide which areas of a room are visible or hidden from a camera. Find and compare areas of triangles and quadrilaterals. Calculate and compare percentages and/or fractions of areas. Before the lesson, students attempt the Security Cameras task individually. You review their responses and formulate questions for students to consider in order to improve their work. At the start of the lesson, students respond individually to the questions set. They then work in small groups to produce a joint solution to the Security Cameras task, in the form of a poster. In the same small groups, students evaluate and comment on sample responses, identifying the strengths and weaknesses in these responses and comparing them with their own work. Each individual student will need a copy of the assessment task Security Cameras, a mini-whiteboard, a pen, and an eraser. Provide rules if requested. Each small group of students will need at least two copies of the Plan View, a sheet of poster paper, felt tipped pens, a glue stick, and copies of Sample Responses to Discuss. 20 minutes before the lesson, a 90-minute lesson (or two 50-minute lessons) and 10 minutes in a follow-up lesson. Timings given are only approximate and will depend on the needs of the class.